Shylock and Jessica by Maurice Gottlieb, January 1876 - from the catalogue of paintings removed from Poland by the German occupation authorities during the years 1939 -1945. Shylock is a fictional character in William Shakespeare's play, The Merchant of Venice. A Venetian Jewish moneylender, Shylock is the play's principal antagonist. Typically played as a villain until the nineteenth century, Shylock has been increasingly portrayed as a semi-tragic figure whose vengeful acts arise from his victimization. Shylock is not a Jewish name, nor are instances of it before its use in Shakespeare's play known. However, scholars believe it probably derives from the biblical name Shalah, which is 'Shelach' in Hebrew. The Italian composer Aldo Finzi, painfully hurt firstly at seeing the German and Austrian fugitives from the Nazis’ persecution fleeing to Italy and then personally hit by Italian racial laws, he began to write an opera in 1937. He entitled it SHYLOCK, the Venetian Jewish character in Shakespeare’s play. Inspired by it, but swerving from Shakespeare’s original play script because after the trial, Shylock disappears from the scene. 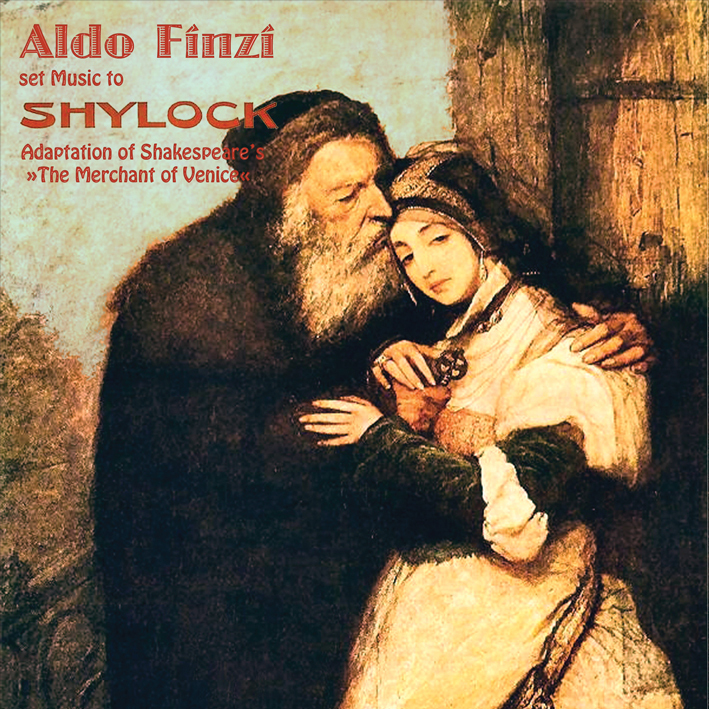 In Finzi’s adaptation, however, he gets him back as well as Jessica, who had left her father Shylock. She instead stand by him when he is defeated and humiliated. For the opera libretto, Finzi made use of the writer Arturo Rossato who only wrote the first act while the second and third acts were written by Finzi because he could not practise any activity due to the racial laws and was therefore in an economically limited situation meaning not enough money to pay the librettist. To be able to write the second and third acts he had to neglect the musical part of them, so the composition was left in singing and piano for the first act only. Regrettably, he passed away before completing the opera and it remained unfinished. The orchestration of the first act is the work of Maestro Gian Paolo Sanzogno. The first act begins with a scene between merchants and people passing by next to the Rialto bridge: Lorenzo tells Antonio, a rich merchant friend of his, about his love for Jessica but also asks him for a three thousand ducats loan which would help him achieving his love getting married to Jessica. Antonio doesn’t have the money but offers to guarantee the loan so as to get the amount from Shylock. Shylock agrees to lend the three thousand ducats at no interest, but shouldn’t Antonio repay the loan by the deadline, he will have to pay for the loan with a pound of his own flesh. When Shylock departs Jessica appears; she was hiding till then and the two lovers can at last talk together (duetto d’amore). In the second act, Shylock and Jessica talk about their suffering seeing all around the world Israeli people despised and disdained. Shylock tells her about the horrible bond made with Antonio, a bond he wants to be considered as valid at any cost and which bond Antonio wants to honour. Another friend, Bassanio, offers his own economical support to Antonio to enable him settling the debt but Shylock doesn’t want money, he wants the pound of flesh. Porzia who is in love with Bassanio, on her side, offers to defend him in the imminent judgement before the Duke’s Court. The third act takes place before the Court of Justice and Shylock insists on the dreadful fulfilment even after the Duke’s exhortations: Porzia, disguised as a Doctor of Law, in Antonio’s defence, reminds Shylock that insisting in his claim on Antonio would mean his own death as a result; upon Antonio’s request the Duke gives Shylock his life. Feeling so humiliated Shylock prostates himself on the ground. Jessica gets close to her father’s lifeless body with despairing sorrow words.